It is interesting to see the return of the CH to the flyer line. From a production standpoint they have been gone a while. Maybe this is my imagination wandering a bit but I wonder if Lionel is looking at this as a current barometer on “scale” cars. It has been quite a bit of time since the first fiasco and for some it might be a faded memory, and for others this new boost with the 3rd iteration of the model might be a first look at this 2012 (I think) initial offering. I hope it is successful, and maybe leads to the market confidence to try something new. If I was still in “scale high rail”, I would be in on both the BN and UP offerings. On a side note, I find it odd that there are no Canadian offerings. If Lionel was watching the secondary market on these things over the past 5 years, they would see the demand for the Government of Canada cars is respectable. I'm encouraged about the new trucks, I've complained often about the height of the old truck (right) and that it was probably one of the reasons a lot of Scalers looked the other way. It remains to be seen if the old Flyer scale wheelsets are compatible with this new truck, if conversion wheels will be available from Lionel or if I continue to use AM or MTH trucks for conversion. 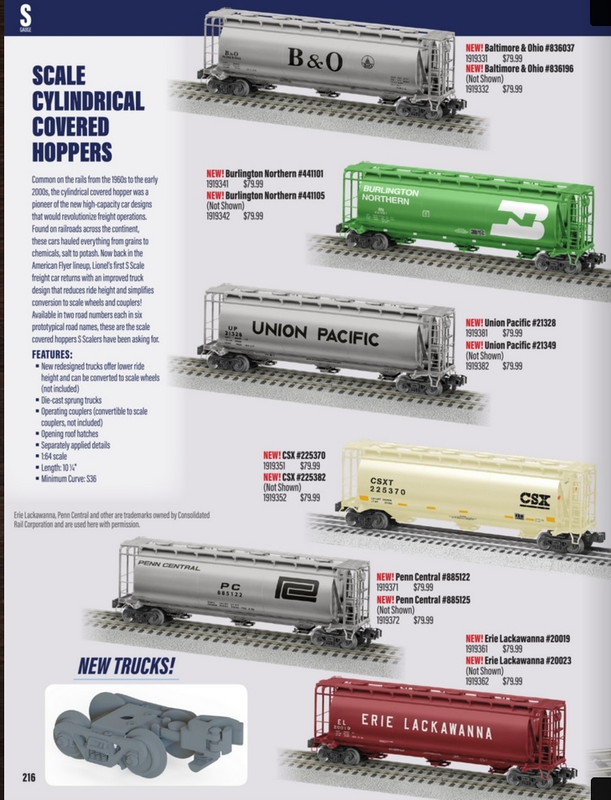 I believe this is a second attempt by Lionel to see if modern freight will sell. 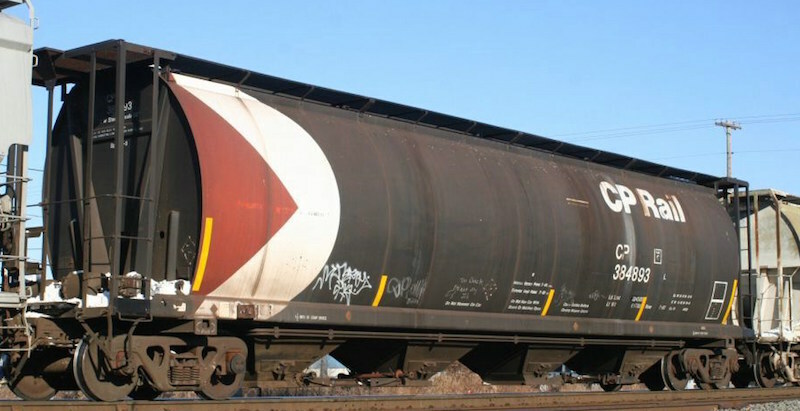 The argument in the past that the Mechanical Reefers did not sell because the tooling/trucks on the cylindrical Hoppers was off and no one wanted to take the risk of buying them until the saw this was corrected. between the SD70's being issued and this I think this is another attempt to see our interest. If both sell well I would expect that they may be more inclined to invest in some new modern freight cars. I intend to buy both. And this car is impossible to find. I'm glad I bought one when they were released. I received an empty box! They were out already when I called to report it. The SD70's have a good selection of roadnames available. The UP "Spirit" will most likely be a sell out. This run of cylindrical hoppers is where everything is pretty much right. The first run was highly anticipated, but wound up with the double whammy of hi-pants trucks and out of gauge scale wheels. Nobody was happy. After that came the tsunami of fantasy NS cars, still with hi-pants trucks but at least with hirail wheels. There were a couple of prototype decorated cars, but I think the overload of the NS fantasy is what did them in. My observation is the prototype paint schemes sold well. And we never will know the real reason the 57' mechanical reefers were cancelled the way they were (on the date they were to start shipping, not shortly after the order deadline past.) Retribution, perhaps? There seems to be some interest from the scale side with this newest run of hoppers, so we'll have to see how things go.